Three weeks after my daughter was born she suddenly started crying in the evenings for several hours until at last she fell asleep. I called my doula who suggested that I get a sling. Where do I get a sling? I asked. She suggested that I look for information in Mothering Magazine. With that I was introduced at once to two very important resources. See the sights, feel the love! The sling – which I ordered right away, got a week later, and was never without for the next four years, was the first. Second was Mothering Magazine, which I did not actually start reading until a few months later when a friend in India gave me her back issues that she had kept since her own kids were little. Imagine my surprise to browse a magazine for mothers and find an article on Ralph Nader! I read about simple living and so much more that blended my politics with my daily life especially in light of motherhood. A few months later I chanced upon the bulletin board and learned some more wonderful things from mothering.com/disussions, most importantly that babies did not need diapers and that they did not need to be fed with a spoon. Indeed, many people emphasized, they were better off without either of these, and could learn good eating and good hygiene habits if we practiced good communication, rooted in good listening. Good listening was facilitated by my sling. Baby in the sling needed only to nudge, squirm, or look expectantly and we could listen … was she showing us something? Asking us to go somewhere? Babbling genially? Expecting to nurse? Squirming for the potty? Nodding off to sleep? Being in the sling, baby listened to us, followed the rhythm of conversation, and its connection to human activity. And most of all it facilitated human activity – especially mine. With baby in the sling I could carry on my activities and let baby watch, nurse, fall asleep, or wake up as she wished. I could work around the house, outside, on the computer, even attend meetings. I used to walk and nurse at the same time. I could be running an errand, marching in a rally, or just taking a walk. She could do her thing while I did mine. In the sling, she fell asleep easily. When she had quick and light naps, she could sleep and wake in the sling and it was no big deal – none of the frustration of “I put her down and she wakes up!” because she would just drift into and out of sleep in the same cozy position. There are various kinds of slings – I tried the kind with numerous snaps and clasps, but unless one planned to get into it and stay there without nursing, going to potty, or getting down for quite a while, it was not convenient. The ring sling is easy to adjust. I could extend it so that she could nurse and then tighten it so that she could put her head on my shoulder to sleep. It is also easy-in, easy out. If I wanted to transfer her, asleep, to the bed with minimal disturbance, I could just lay her down, sling and all, and slip my head out. One can also transfer a baby in a sling from one person to another, adjusting the rings as needed. 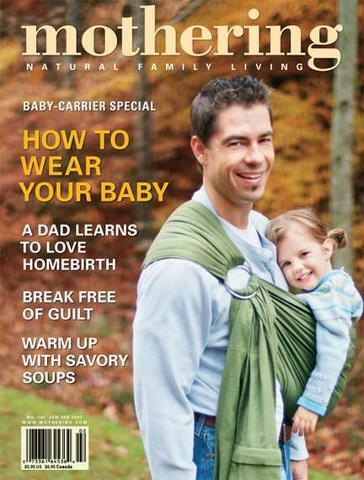 The Mothering Magazine cover photo shows the sling in the correct position – the shoulder strap should be on your shoulder, not your neck. If you spread it across your shoulder it is less likely to slide towards your neck, but if it does, you can just slide it back and spread it out. Arun and Swarit get some fresh air on the terrace. Manshi enjoys a walk with Abir. Walking around town with baby in the sling. Chetana is out with Disha and a friend. Sunita carries Anika in cradle position in the sling. Peter eats while cradling Swandana in her sling. 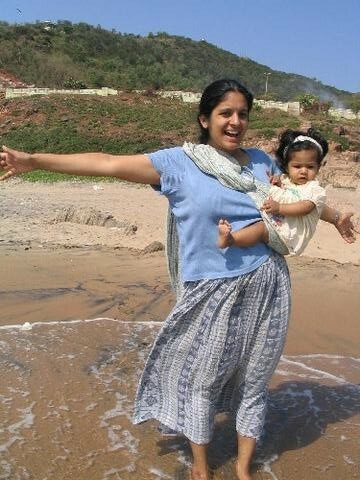 Seema carries Mihika in the sling. Dushyant goes out for a walk with Rewa.